Nothing at all of note happened on the 16th. Not in chat, anyway. Luckily, lots happened on the 17th, so here we go! As has been said previously, ‘modular’ does not mean lego. (12:38:12 PM) CIG Matt Sherman: Modular also doesn’t mean ships are legos, there’s still going to be limits to what modules/rooms may be available. (12:40:42 PM) CIG Matt Sherman: Ya, that pic will never happen in-game. (12:40:57 PM) CIG Matt Sherman: Manned-turret sizes will not be 1:1 to hardpoint sizes. (12:43:03 PM) CIG Matt Sherman: We have an internal design for repair, but nothing really to show/talk about until we get it to a fully working prototype. (12:47:09 PM) CIG Matt Sherman: There’s already plans for a more research-leaning variant of the Reliant which would be able to serve for some exploration. Comments about Saitek being low quality don’t make much sense. The new HOTAS will be an excellent chance for Saitek to improve their quality, just as MadCatz did with Street Fighter 4. (12:56:07 PM) CIG Matt Sherman: I still find any anti-MadCatz/Saitek comments amusing, I just keep thinking none of the people complaining have followed how the company handled their fight-sticks when SF4 was first launching. (12:56:53 PM) CIG Matt Sherman: When there was a big anchor-game releasing that would genuinely help compell more hardware sales, MadCatz stepped up tremendously and now is the defacto-hardware at most fighting-game events. (12:57:29 PM) CIG Matt Sherman: Before SF4, any high-end FGC hardware was relegated to bouties, imports, and custom-built hardware for the competitive scene. (12:57:59 PM) CIG Matt Sherman: Then, MadCatz made a hardware-parity stick that competed with the best 300-dollar imports at the 150-price range and basically dominated the market. (12:58:55 PM) CIG Matt Sherman: @Apoc: But before SF4, MadCatz sticks were junk as well. It just takes that one major title to compell the sales and turn a new page. Talking about Virtual Reality, OR is Oculus Rift. (1:36:51 PM) CIG Matt Sherman: It’s smart that OR is bundling a controller with every kit actually. (1:37:05 PM) CIG Matt Sherman: That way, they know with certainty that EVERY owner will have that device. (1:37:17 PM) CIG Matt Sherman: It’s not marketing, it’s compatability forsight. (1:38:22 PM) CIG Matt Sherman: The Oculus Touch devices are still in development also, iirc, they’re not going to be launching day-of with the OR. (1:38:48 PM) CIG Matt Sherman: Plus, those things are going to involve a TON of extra support and really will only turn out well in games designed exclusively for that kind of input. (1:39:31 PM) CIG Matt Sherman: OR-support on our end is more going to be when the final DK’s are out AFAIK, beyond that, I’m not really involved in FPS stuff, more than enough ship-work to do. (1:41:30 PM) CIG Matt Sherman: I’m still unsure on the Vive just because I’ve still yet to hear of or see a demo where they weren’t using the wand-system and the full walk-about input. On persistent ships, such as the Bengal / Pegasus, we probably won’t get details for a while. (2:19:32 PM) CIG Matt Sherman: Don’t expect concrete details on the massive persistent ships for a while. There’s going to be a long, long road between them even being in-game and them being functional. (2:22:11 PM) CIG Matt Sherman: There’s still going to be differences between ships like the Idris/Jav and the massive ships like the Bengal/Pegasus. Component sizes are still being worked on, but there are four component sizes, light, medium, heavy, and Capital. Some ships will have components of mixed sizes. (2:26:38 PM) CIG Matt Sherman: If you’re talking component-size class, then ya, the Idris and Bengal are both going to be using Cap-size components. (2:28:58 PM) CIG Matt Sherman: Some ships will have components of mixed size-classes. You won’t be swapping out one capital component for 64 light components. (2:34:45 PM) CIG Matt Sherman: There’s going to be some accomodations for some down-sizing, but not against the full size-spectrum. More on the Cutlass. The Cutlass has not been tuned yet, is not 100% representative of where it will be in the end game, just like no ship is 100% where it’s going to be. (5:19:45 PM) CIG Matt Sherman: Role-effectiveness is more going to be how you’ve setup your loadout and component tuning. (5:22:07 PM) CIG Matt Sherman: Won’t give any hard-targets on performance right now, in part because the component/tuning setup is still ongoing, but also as Thadeaus mentioned, a lot will play into how acclimated a pilot/crew is running a ship. (5:26:42 PM) CIG Matt Sherman: That’s not to say you can’t specialize the loadout in a Cutlass though. (5:27:26 PM) CIG Matt Sherman: But again, a lot of this would still go back to things that can’t really be fully answered right now because of the on-going tuning rework, but it’s not something we’re not cognizant of while we’re designing everything. (5:31:58 PM) CIG Matt Sherman: Pre-1.1.5, ya, it was tissue paper, but it got ~3x health across the board in the patch. CIG have no intentions at all to remove gimbals. There are other ways to balance, and they will continue to balance them, but they won’t be disappearing. (5:34:25 PM) CIG Matt Sherman: We’re not entertaining removing gimbals, we’ve never said we’re not going to keep tuning them like anything else. (5:34:55 PM) CIG Matt Sherman: We already reduced slew rates with the patch, we’ve got more tuning hooks available, so thinking we can’t/won’t tune and balance gimbals is more a figment of mob-imagination. Quantum Drive will get a design post when it’s a thing we can do for ourselves. Also, you are able to engage Quantum without having a target. (7:44:06 PM) CIG Matt Sherman: QD will probably get a design post when it’s a more tangible, interactive thing in the live-builds. It’s still being developed and iterated on now, so a deep dive post wouldn’t be the best atm. Quantum Drive mechanics are still being built out. Trying to guess gameplay implications before a system exists leads nowhere, and doesn’t help. (8:15:09 PM) CIG Matt Sherman: Don’t try to much to read into those comments guys. Like I mentioned, QD mechanics are still being built out, and we’ll do a good deep dive when the system is ready, but trying to pre-empt certain gameplay implications now won’t lead anywhere. 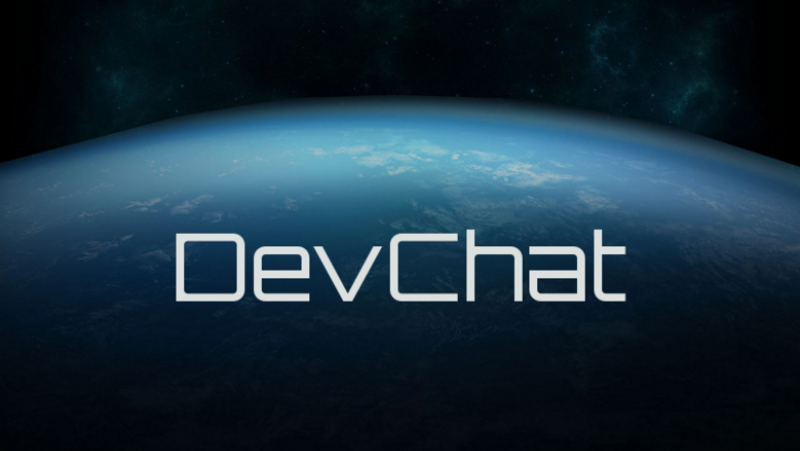 And that’s all for DevChat for today! Thanks for reading, and stay tuned for more DevChat soon!